LTE can enhance emergency responders operations by delivering high-data-rate services to wide coverage areas. Such communication links can support digital imaging, video streaming, voice, large data download, and other capabilities which cannot be supported over the traditional narrowband network. LTE Wireless broadband networks allow mission-critical information to be exchanged in real-time, anytime, anywhere. Database lookups, dispatch messaging, mug shots, video/ surveillance feeds, and broadcasting can now be achieved within seconds instead of hours. 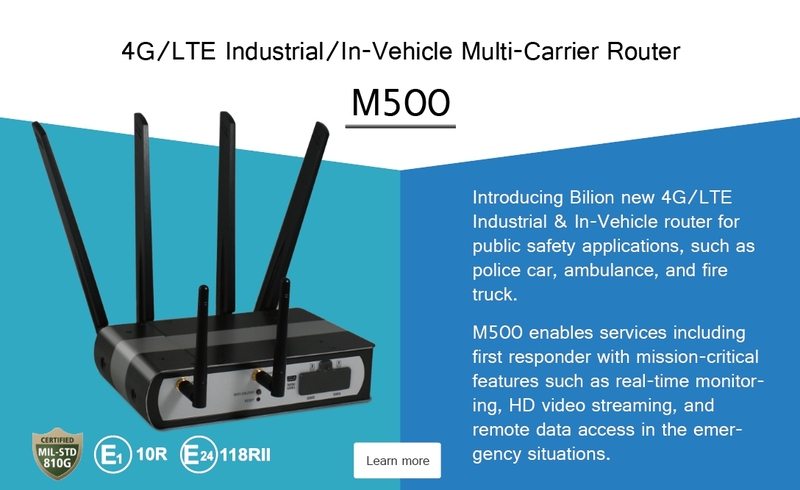 Billion M500 provides dual LTE modules, enable in-vehicle WiFi, real-time imaging streaming, and medical data transferring with instant failover capability. Ambulance staff is allowed to examine patient media records, plan driving routes, and communicate with emergency room and fleet dispatchers to allocate the available vehicle resource to resolve emergency scenarios. The dual-Radio supports multi-channel video recording and streaming with always-on, extensive broadband feasibility. Thus, Billion M500 can transmit the images of a patient’s injuries from the ambulance to the emergency room for treatment advice and minimize the gaps of medical care upon arrival at hospitals. Support digital imaging, video streaming, voice, and large data download. Enhance emergency responders operations by delivering high-data-rate services to full coverage areas. Allow mission-critical information to be exchanged in real-time, anytime, anywhere. Support rapid boot up and wake-on-call functions. Reduce delays and enhance driving safety through the integration of tire pressure monitoring system and forwarded collision warning. Bus companies look for reliable Smart Bus solutions that can provide free or pay-for-use WiFi Hotspot service in the moving vehicles and the delivery of driver and vehicle status back to the centralized dispatch center for real-time management. Billion M500 provides an excellent in-vehicle networking CPE equipped with dual radio and SIM, assisting system integrators in designing an always-on wireless architecture with the advancement of onboard mobile service and HotSpot captive portal. Supporting 10-56V DC power input designed for handling transient voltage and GPS/GLONASS for location tracking, Billion M500 is an industrial-grade, in-vehicle computing router that as passed the European E-Mark (E1) certification with authentication login to enable a Smart Bus experience. The Financial Services industry is shifting in large part due to the benefits of the latest generation of mobile wireless technologies, 4G LTE. The most significant benefits of 4G LTE are higher bandwidth, lower latency and improved spectrum efficiency. These benefits not only allow for fast electronic transactions they enable new business models such as targeted marketing, location-based offers, interactive services and an overall improved customer experience. Billion M100 provides a higher bandwidth, lower latency, and improved spectrum efficiency. These advantages not only allow for fast electronic transactions, but they also enable new business models such as targeted marketing, location-based offers, interactive services and an overall improved customer experience. Billion M100 is helping retailers meet consumer expectations and become more competitive by providing wireless technology solutions that quickly integrate with Point-of-Sale (PoS) Systems, Automated Teller Machines (ATMs), Multi-purpose Kiosks and Vending Machines. Either primary connection or backup connection when wired connections are unavailable or non-existent. Fixed wireless communications platform enabling real-time 4G Cellular data connectivity for existing serial devices & Ethernet network. Reliable and cost-effective alternative solution for business continuity.